Juventutem was very blessed is our participation in the World Youth Day festival held in Panama City, Panama, during January 2019. On Friday morning, 26 October, FIJ Secretary Paul Schultz will address those who attend the Summorum Pontificum Meeting (tickets) organized by Oremus Paix Liturgique, together with the International Federation Una Voce, and Juventutem. Juventutem members will attend the opening Mass that Fr. Charles Ike FSSP will celebrate at 6:00 pm at Santissima Trinità dei Pellegrini. After Mass, we will meet up for dinner at Da Vittoria a Trastevere for dinner. Please RSVP via Facebook, here. On Saturday, we will join in the Adoration at San Lorenzo in Damaso, the Procession across Rome, and the Pontifical Mass at St. Peter Basilica. After Mass, with the support of Paix Liturgique, we will meet up at Via della Conciliazione 51 – please RSVP via email as soon as possible: secretary at juventutem dot org. In addition to discussing preparation for our forthcoming trip to World Youth Day Panama (register here), one of the items that we will discuss in our meetings with be the next Secretary of the Fœderatio Internationalis Juventutem. 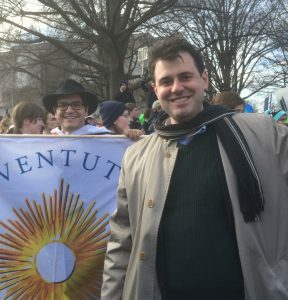 Paul Schultz, the founding Group Coordinator of Juventutem Michigan, has served as the Secretary of the FIJ since 18 November 2013 and has also served as coordinator of Juventutem activities in North America since January 2013. If a capable replacement Secretary can be found, Paul is interested to retire to the position of Secretary Emeritus on or about 18 November 2018. 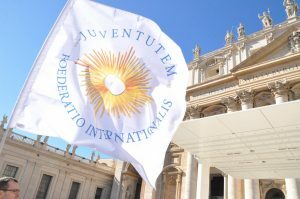 Any new Secretary of Juventutem will be chosen by the Bureau of the FIJ – the President (Bertalan Kiss), the International Ecclesiastical Assistant (Fr. Armand de Malleray FSSP), the Treasurer (Cosimo Damiano Marti), and the current Secretary. In making its selection, the Bureau may freely consult with members of active Juventutem chapters around the world. 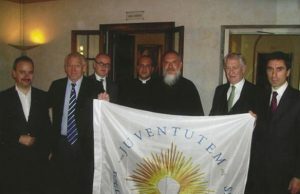 – Communicating with chapters of Juventutem as to participating in international events such as World Youth Day and as to paying the annual dues. – Receiving communications from the Vatican’s Dicastery for Laity, Family, and Life and responding to them or causing them to be responded to by the Juventutem member who competence it is to do so. – Receiving inquiries from those who are interested in seeking to affiliate a group of young adults to the Juventutem movement and facilitating the consideration of their applications by the full Bureau. 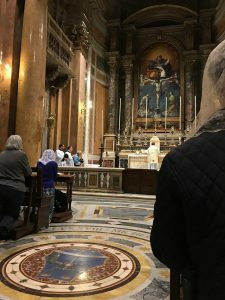 – Meeting members of Juventutem and other faithful attached to the Traditional Latin Mass in person as often as possible. Together with the other members of the Bureau, the Secretary supports the institutional memory of Juventutem – both by familiarizing himself or herself with such resources as exist to report on Juventutem as well as by exercising active curiosity to query those with personal experience of Juventutem’s activities. – Fulfill the Criteria for Admission under the Charter of Juventutem (particularly paragraphs 27-28). – Practice the Three Spiritual Commitments set forth in paragraph 22 of the Charter. – Have paid the 2018-2019 member dues to the FIJ (wiring instructions here; or submit 10€ here). – Have a high level of proficiency with Information Technology and Social Media (particularly Facebook, GMail, Google Hangouts, Skype, Google Documents, and Twitter). – Submit a resume demonstrating fulfillment of the criteria – providing examples where possible. – Be an unpaid volunteer who pays his or her own way to most or all activities. – Participate in an interview, if requested. – Write and speak English with confidence. – Write and speak more than one language with confidence (French, Italian, and/or Spanish preferably). – Have advocated for Catholic young adults and that resources – money, time, space – be utilized to promote their sanctification. – Be familiar with internet posting, such as blogs (ideally WordPress CMS). – Demonstrate excellent in leading groups of Catholic young adults (ideally including a Juventutem group). – Have represented organizations at international public events. – Attend the 2018 pilgrimage in Rome or register to attend and pay all fees associated with attending WYD Panama 2019. – name and provide contact information for two Juventutem members or clerics who would be prepared to speak to the candidate’s qualification for serving as secretary of an international lay movement. To apply for the position please email the above described resume to Paul Schultz, the current Secretary of Juventutem – secretary at juventutem dot org. Resumes received before 19 October 2018 will have the benefit of being considered by the President, Secretary, and Treasurer as they meet together in person at the pilgrimage in Rome with other Juventutem members. Resumes received after the pilgrimage will also be considered. Juventutem thanks Pope Benedict XVI for Summorum Pontificum, as well as all the bishops and priests who made the EF Mass more widely available, and the laity who supported it for the greater glory of God and the good of souls. Juventutem was glad to partake in the Tenth Anniversary Celebrations organised in Rome for the occasion. 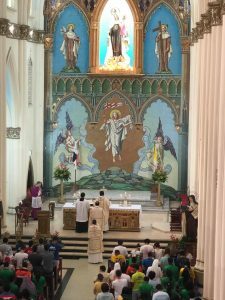 As part of the celebrations, the Prefect of the Congregation for Divine Worship, His Eminence Robert Cardinal Sarah, gave an address. We are grateful for the encouragements of Cardinal Sarah. They correspond to our aim since our beginning. From its inception in 2004, Juventutem has worked hard to share the riches of the traditional Latin Mass and spirituality with anyone interested. From the start we took risks and initiatives to work together with fellow Catholics and with diocesan bishops, at a time when few within the Church wished it to happen, and when others did not dare to hope for it. 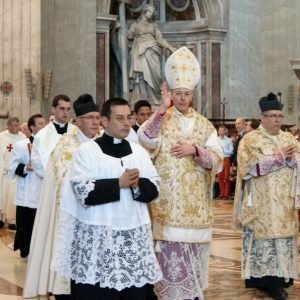 Ten years after Summorum Pontificum however, its implementation remains patchy and many young adults and families still have great difficulties accessing EF Mass centres. It is a blessing that many capital cities now offer provision for EF Masses. But families, young adults and single adults as well aspire to more than the Mass. They wish all sacraments and sacramentals to be available according to the EF on an a day-to-day basis, in addition to spiritual direction, adult formation and catechism. 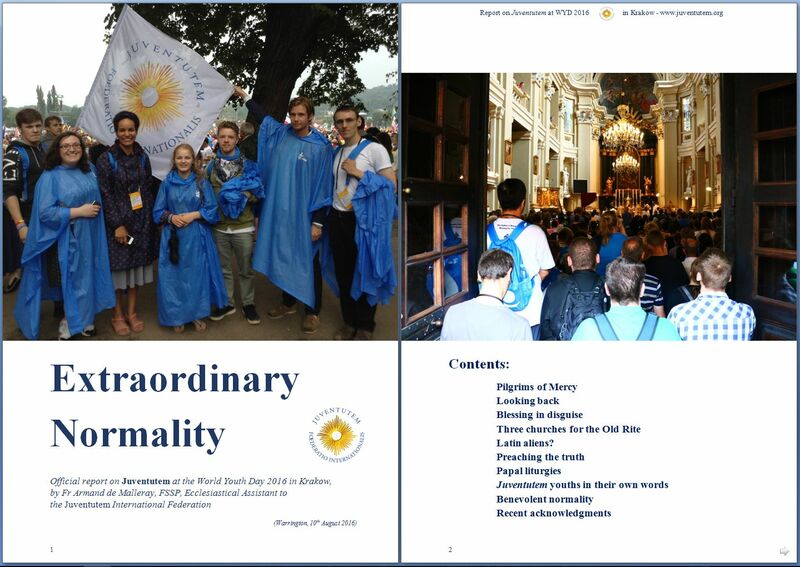 If anyone wishes to assess the dispositions of the new generation of Catholics attracted to the Usus Antiquior, we suggest they read the Report of the Juventutem Federation after World Youth Day in Krakow last year. The Report shows that these young adults and their clergy do not see themselves as part of a ghetto – unless by ghetto one simply means the Catholic Church at large, inasmuch as she is surrounded by a hostile world to which, with motherly zeal, she endeavours to bring the light of salvation. The young adults and professionals part of Juventutem, or simply taking part in its events, are glad to be given the opportunity to share the riches of the Roman traditions of the Church, for our own sanctification and for the conversion of the world to Christ the only Saviour. 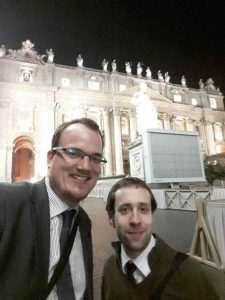 At the invitation of the Holy See, Bertalan Kiss – the President of the Fœderatio Internationalis Juventutem – spent much of the first week of passiontide in Rome, as a member of a conference which reviewed the lessons learned at the WYD festival in Krakow, began to plan the WYD festival in Panama, and advised ecclesiastics in preparation for 2018’s Synod of Bishops on youth and vocation. 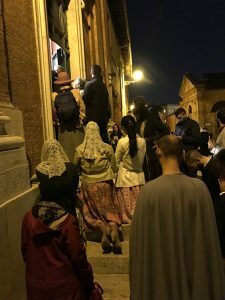 In order for the young adults of Juventutem to do their little part to continue to advocate around the world for the Roman Tradition of the Church, it is necessary to have the prayer and other support of young adults and not-young adults. Please consider donating to support this year’s efforts! 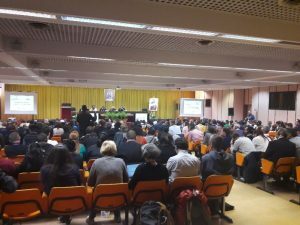 Just before the most sacred of feasts, the death and resurrection of our Lord Jesus Christ began this year, the new dicastery of the Vatican for the Laity, Family, and Life organised a conference in Rome for the national delegates of episcopal conferences’ youth ministries and other various international youth associations. The Foederatio Internationalis Juventutem has also received an invitation to this event, and I took it upon myself to represent our federation. Accompanying me was the newest member of Juventutem Magyarország, and a fervent organiser of youth events in the Hungarian diocese of Vác, my friend Ervin Dér. 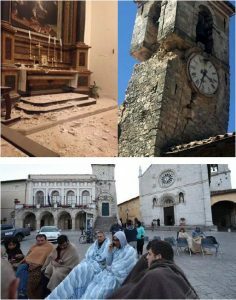 In 2017, the 6th Populus Summorum Pontificum pilgrimage to the seat of Peter will take place from the 14th to the 17th of September, in celebration of the 10th anniversary of the entry into force of Pope Benedict XVI’s motu proprio Summorum Pontificum. 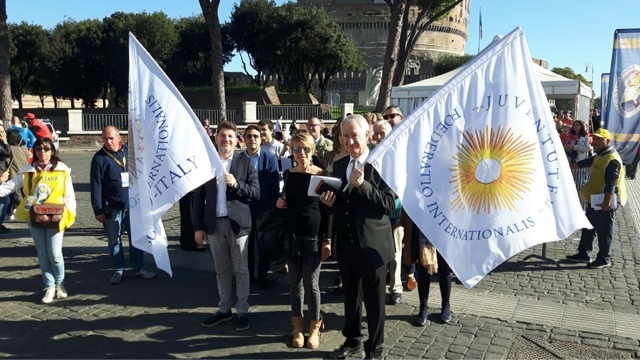 Over the last weekend of October 2016, FIJ Treasurer Cosimo Damiano Marti was present in Rome as one of the pilgrims participating in the 5th edition of this great pilgrimage. Cosimo has asked us to share with all of our fans these pictures from various sources. And to commend to you Archbishop Sample’s Homily for the Feast of Christ the King. The following picture was taken during a friendly dinner on the last day of the pilgrimage. From left to right, those pictured are Felipe Alanis Suárez (President of international Una Voce federation), Christian Marquant (Chairman of Paix Liturgique (“Liturgical Peace”)), Marco Sgroi (Chairman of the Coordinamento nazionale del Summorum Pontificum), Fr. Matthieu Raffray (Superior of the Latin American District of l’Institut du Bon Pasteur), Fr Gabriel Diaz-Patri (a researcher of the Centre International d’Etudes Liturgiques in France), Cosimo Damiano Marti, and Louis de Lestang (Vice-Chairman of Paix Liturgique). Click on the picture below to open the 24-page pdf. 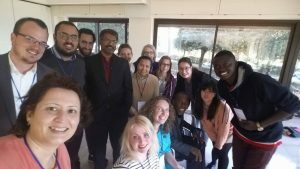 “I thoroughly enjoyed my experience of giving a morning of catechesis to the young adults of the Juventutem International Federation. I was quite impressed with their maturity and the quality of their attention and questions after the presentation of the catechesis. 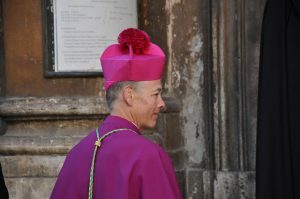 I was also delighted to be able to participate in the celebration of the Solemn Pontifical Mass offered by Bishop Schneider. I was edified by the prayerfulness of the young people in attendance. May God bless you and all the member of the Juventutem International Federation. I was glad to meet your group, including some Dubliners, for catechesis and Mass last week in Krakow. When I was requested by the Vatican to do so, I wondered if I would need to preach in Latin, but happily, English was sufficient! Answering Pope Francis’ invitation, you came to Poland from various countries to learn about divine mercy, to make friends and to worship God together. 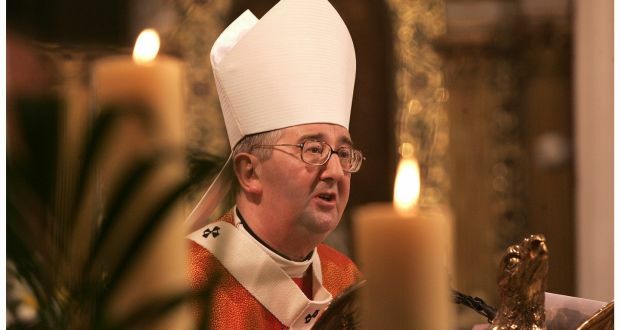 I am sure that, as the Holy Father pointed out at the Vigil, you will not “confuse happiness with a sofa” but rather will “offer the best of yourselves”. May God inspire you, through an always more personal encounter with Him Who is Love incarnate. Read about the wonderful event on the National Catholic Register, clicking on the link below!